Namibia's many parks and game reserves are of two basic types. Some, such as well-known Etosha National Park, are like most southern African parks focused primarily on wildlife. Others, including the coastal parks and Fish River Canyon, are are spectacular wilderness areas, where the beauty of the scenery easily upstages the game. The descriptions that follow are for only a selected few of Namibia's many fine parks. Etosha is Namibia's premier big game park, comparable in size and diversity of species to any other reserve on the continent. It is especially renowned for its abundant population of elephants, though in fact it contains sizeable populations of an enormous variety of species. Many different antelope species, including gemsbok, impala, dik-dik, springbok, eland, kudu, and duiker, are here, as are wildebeest, hartebeest, and zebra. Lion, leopard, and cheetah are also found in Etosha, and giraffe and rhino as well. 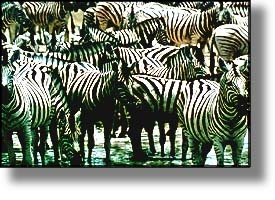 What draws all of these creatures to Etosha is water. At the center of Etosha Park is the enormous shallow bowl of the Etosha Pan, a depression that was once a lakebed. Although the pan does fill with water during periods of unusually heavy rainfall, the watersource on which the wildlife depend is a series of underground springs that dot the pan's perimeter. If you visit between May and September, when the pan is quite dry, the temperature cool, and the wildlife thirsty, the contrast between the barren landscape and the concentration of animals can be stunning. The narrow corridor of the Caprivi Strip is the locale of several smaller parks and game reserves. The attraction of these parks is that they permit open-vehicle drives as well as walking, but the tragedy is that their wildlife populations have suffered enormously from poaching. Recovery does seem to be proceeding rapidly, but at present the appeal of the Caprivi parks really rests upon the fact that they are both uncrowded and open to intimate exploration on foot or by boat. Only the Grand Canyon is larger. Fish River Canyon extends for one hundred miles (160 km) north to south along the Orange River in southern Namibia. It reaches widths of 17 miles (27 km) and depths of 1800 feet (550 m). The vistas offered from various points along the rim are, as one might expect, simply incredible. However, for those who are sufficiently interested, and sufficiently fit, there is a terrific 4-5 day, 53 mile (86 km) trek along the canyon floor. The Namib Desert stretches for eight hundred miles (1300 km) along the African coastline and is undoubtedly one of the world's most spectacularly barren and mysterious environments. In Namibia, two large parks encompass much of the Namib: Skeleton Coast Park, in the north, and Namib-Naukluft National Park, in the south. The name is no mere metaphor. This coast is a graveyard for ill-fated seafarers and inattentive whales, and the dense fogs that frequently arise here shroud shipwrecks and bones as well as the surreal dunes of the Namib. The primary wildlife attraction of the Skeleton Coast is Cape Frio, which harbours a seal colony numbering in the tens of thousands. However, the wildlife here pales in comparison to the land itself, and the most popular adventure travel activity here is trekking along the coast. Namibia's southern coastal park is enormous, measuring almost 20,000 sq. miles (50,000 sq. km.) and encompassing a wide variety of different desert environments. 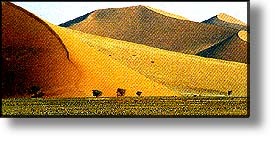 The most dramatically beautiful of these is the Sossusvlei region, where one encounters massive, apricot-orange sand dunes that are higher than any in the world. Other areas of Namib-Naukluft worth mentioning are the starkly beautiful Naukluft Mountains, a favored trekking destination, and the intimate Sesriem Canyon.